ibis budget (formerly Etap Hotel), the smart accommodation choice! Choose to stay in an inviting, modern room when on your travels. Each room is designed to accommodate 1, 2 or 3 people (depending on the country) and has a shower, toilet and satellite TV - all for an affordable price. Kick start your day with a delicious breakfast for a price that won't break the bank! Very good condition, and very convenient to go to the airport. Mostly good, staff were friendly & helpful. Room was clean, enjoyed breakfast. Unfortunately the shower head holder was broken, so you had to hold it all the time and the head was held onto the pipe with tape. Not very hygienic. Also the bunk bed was not made up, I had to make it up myself. When the room was cleaned, they again did not make the bunk bed. Good but bad odour shower unit. Room 201 has a pretty bad smoke problem.. classified as non smoke, obviously (burn stains on the floor) people smoked in there. Is it too much asked to provide a small plate for breakfast? Buttering a slice of bread on a flimsy napkin is not exactly chique. And last but not least. A slice of ham would be great! Our one-night stay was comfortable and the breakfast was good. 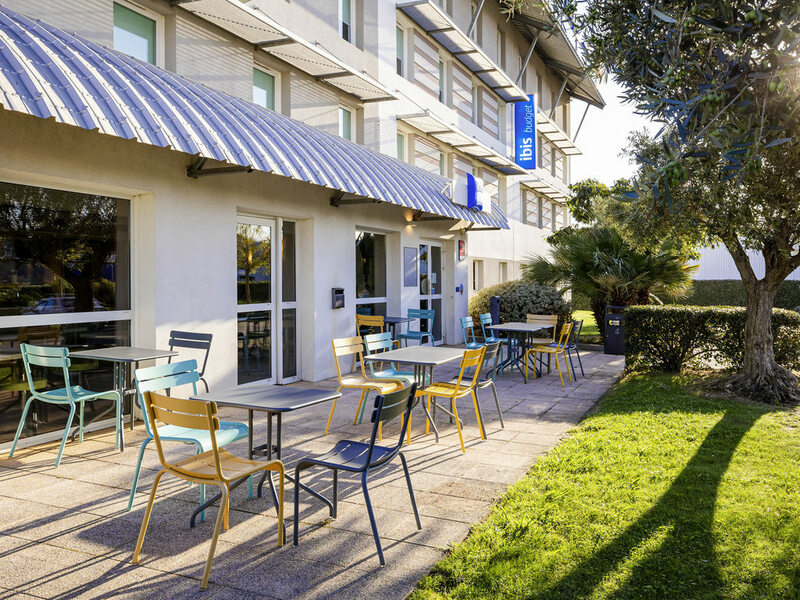 The hotel was conveniently close to the autoroute and Carcassonne airport. The worst thing was the shower smelled awful so we didn't use it: we think the drain hole needed cleaning and disinfecting. Why don't hotels check this regularly? Also, the room would benefit from power sockets near the bed (there was one right by the sink and an inaccessible one by the TV). There was no hairdryer (it's a basic ibis). Enjoyable stay, clean an neat. One of your staff went over and above by driving us to the airport when the taxi failed to show up. Well done. She also helped us get our boarding pass. The breakfast was well presented and lots of it to satisfy us for the day. We stayed on a Saturday night & were very pleased with the hotel. We had a car & drove in to the city to eat, there is/are restaurant(s) within walking distance of the hotel, but I don't know how easy it is to get into the city without transport. We had breakfast which was good value & saved us stopping on our onward journey, although we were disappointed with pre-packed croissants (maybe this was just because it was a Sunday morning). We would definitely stay again. Immaculate and comfortable for our stay. Breakfast buffet was great. Minutes walk from airport was super. We stayed one night at the Ibis airport hotel in Carcassonne. Our stay was made more pleasant by Anne who went out of her way to help us with our transport to the airport and making sure we were looked after during the day as we had a long wait before our flight to Portugal. We found our room clean with a comfy bed although could have done with another pillow. The breakfast was adequate and reasonably priced. It was definitely a good place to stay for one night. Did not realise how basic it is! Our stay was as usual satisfactory, clean tidy good service and close to the main roads, car parking also good. The facilities serve us just right for an overnight stay with our two dogs. Good basic accomodation with helpful staff. Diisappointed to find no hot water for shower and wash basin from 8.30 a.m. Airconditioning worked well and was very welcome. A paper map showing hotel, city, airport and nearest supermarket would be useful. Not everyone has a smart phone. Lots of door banging noise - no sleep at all. Convenient location - BUT every door on the floor like mine needed pulling hard to shut. That meant doors banging until past mid night every time someone entered. It started again at 4:30 AM. Not a problem I have ever had before with any other IBIS - A one off we hope. During the booking process the Accor Reservation App died. Because the App did not show the booking status afterwards i booked it a second time. As i did the online check in i saw two entries and was able to cancel the first one. I got cancelelation number. Then in checked in online the other one. After the stay the hotel booked both. I tried to contact them and explaind the situation. They said its a non refundable reservation and thats it. This was the last trip i did with Accor. A great value for the money! Everything was just as expected. The hotel was clean and convenient.